You've got a business to run, so we'll make this easy for you. Our application takes 7-8 minutes and we can get you funds the same day. We'll search dozens of funding options with a single application to achieve your need for capital. With no credit inquiry there is 0 risk, and you have 0 obligation to take funding. Tiger Funding looks beyond credit scores to analyze your performance as a business owner and rate your business against others in your vertical. 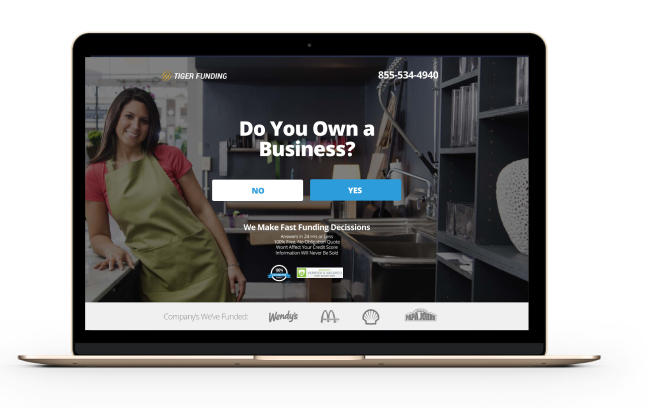 The funding options you'll receive are best matched to you, your business, and your goals. You're not a number represented by your credit score. We know you've worked hard - now it's our turn to work hard for you. Receive white glove service with Tiger and save yourself the headache and legwork of filling out dozens of applications. By filling out our application in just a few minutes you're going to get access to dozens of business loan, business credit, and alternative business funding options. Why go from broker to broker, application to application, wasting dozens of hours? Just fill out one and you're done! We'll bring you many offers and let you choose the best one for your needs. To qualify with Tiger Funding, you should be in business for at least 3 months and have a minimum of $60,000 in annual revenue or $5000 per month in sales over the last 3 consecutive months. You will need to have been in business for 6 months or more to qualify for funding. You should have $5000 or more of sales per month for the last 3 consecutive months to qualify for funding with us and our network of funding partners. If your business funds are separate from your personal funds and you utilize your business bank account for your business you're eligible to apply. Tiger helps businesses find funding fast. We do all the leg work and you call the shots. Here are some of the funding options we can provide for you. Business lending with various interest options and repayment terms that fit your needs for. Business loans, Business Credit, Business Cash Advances - we'll help you get working capital through any avenue possible. Get access to business credit offers and business credit cards that you can't access elsewhere. Receive funding options against your outstanding invoices to existing customers or clients. If you're short on time and in a pinch an MCA is the best way to get money for your business quickly.